Someone from the museum in Mumbai had recommended the Indore museum very highly. “Small, but wonderful collection” she said. I remembered later that she also said “Some of it is very well curated.” It was not clear to me whether the garden behind the museum was well curated. Some wonderful stone sculptures were on display there, but not everything was legibly labeled. Most of the pieces in the garden seemed to have been carved sometime between the 11th and 13th centuries. Some of them are in the slideshow below. As always, you can click on one and scroll through if you want a closer look. The beautiful four armed female goddess in tribhanga pose was hard to identify; one hand holds a kalasha (pot); the only other hand which remains holds an enigmatic symbol which I cannot identify. The featured image was labelled as being from the 12th century CE. It seems to be part of a longer panel. The part that one could see was a little jewel. There were two attractive memorial pillars from Mandsaur made in the 13th century CE. The one which was more complete is topped by a padmashirshaka, or inverted lotus. Above the lotus is a broken piece, perhaps the remains of a kalasha which would traditionally complete the top. Right at the back of the garden was a part of a bracket or wall which showed some disembodied limbs. These were so beautifully carved that I would have liked to know more about it. It had rained hard at night and parts of the garden were quite wet. I negotiated the damp patches in the path, looking as much at squirrels which ran over the sculptures as at the pieces themselves. 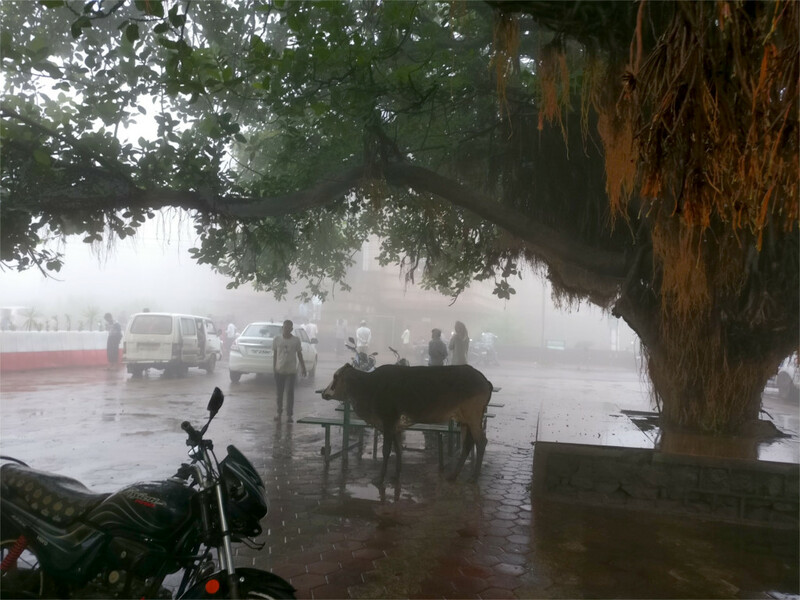 The brilliant green of monsoon and the somber gray stone went well together. 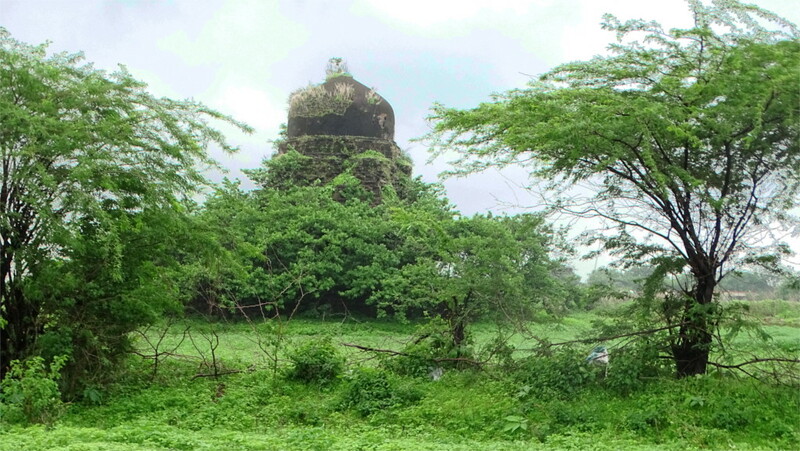 I wonder whether this is how the classic Paramara era temples looked when they were in use: stone structures in the middle of growth and nature. The Indore museum is not large but has a very interesting collection. The Family and I spent a couple of hours wandering through it. One of the first rooms we entered had a collection of coins. I have seen some wonderfully curated collections, and others which are haphazardly put together. Since I’m not fanatically excited by coins, I tend to pay attention only when the collection is curated well. This was surprisingly interesting. I’ve written about the history of the Malwa region over several posts. The earliest coins in this collection came from the time that Ujjain was a republic, and after the time of the Buddha. Soon after this time the republic was incorporated into the Mauryan empire. The next coin was strictly not a coin of Malwa, but one which certainly circulated here: that is the golden coin in the featured photo, from the time of Chandragupta II. At this time Britain was a Roman colony. The copper coin of Narvarman Parmara is the next in historical sequence. He ruled around 1100 CE. In the larger world, the Hoysala empire was reaching its peak around then. The next two coins come from the age of Mandu: one from Hoshang Shah, the builder of the citadel, and one from Baz Bahadur, its last Sultan. The last two coins are from the end of the 18th century, during the reign of Maratha queen Ahilyabai. The coins of the Ujjain janapada are close to the origins of coinage, before the round shape of coins became an established convention. I wonder about the significance of the elephant symbol on these coins. A hundred year old publication says more about the weights and measures of the coins of Mandu. The square coins were common in Mandu, and several other parts of north India, having been adopted from the coinage of Ala ud-din Khilji. Interestingly, the coins of Ahilyabai seem to use the Persian script. When you walk around a ruined medieval citadel you are likely to come across much more than humans. 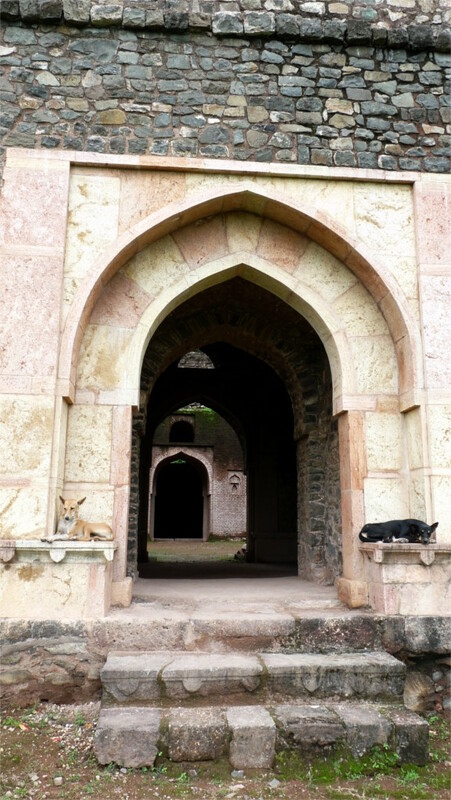 In the sporadically maintained garden of Mandu we came across many of the wonderful creatures we share the earth with. I wrote about some of the birds earlier, but I’d missed one. A peacock displayed its wonderful feathers to a peahen. The peahen looked up once and then sauntered away. I and The Family were the only others in the scene, and we paid him more attention than the object of his love. C’est la vie. 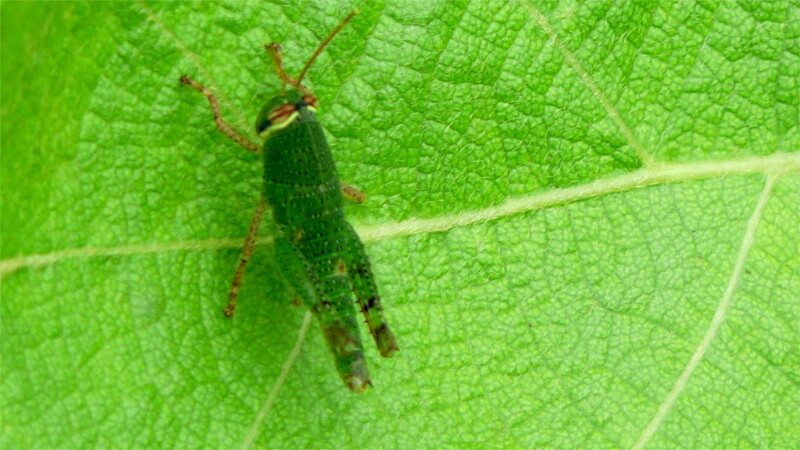 Where there are plants and birds, there will also be the creatures which link these into a web of ecology: the insects. The most noticeable were the butterflies: the common emigrant, the common crow, the common tiger and the common lime (in the photos above). There were many moths too, but I’ve said before how bad I’m at identifying moths. I won’t even try now. The little pools of water had some water lilies. I stood and admired a small pool with these pink lilies. 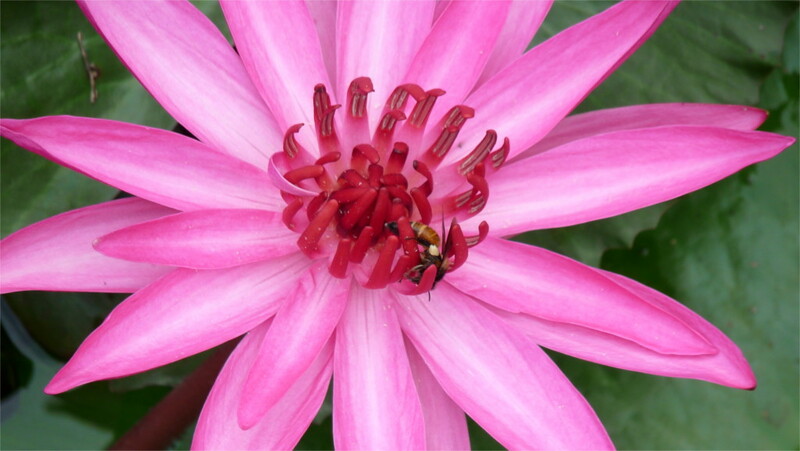 I saw some motion there, and looked closer to find a bee exploring the flower. What an industrious fellow, I thought to myself. Another pool had lotus. No bees here. 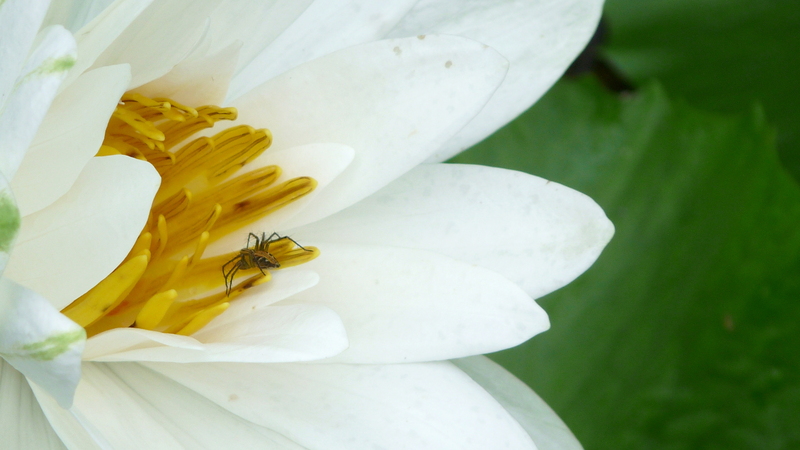 I took some photos and was about to walk away, when I noticed this jumping spider in one of the blooms. These predators often hide inside flowers, waiting for an unwary insect to come in search of dinner, only to become someone else’s dinner instead. I’m always happy to find creatures like this grasshopper. I don’t see them very often, but there must be many of them around. I guess I’ll just have to make a trip with an entomologist to figure out what tricks I’m missing. I suspect the main trick is to look closely. There’s life everywhere you look, unless people have been spraying insecticide. 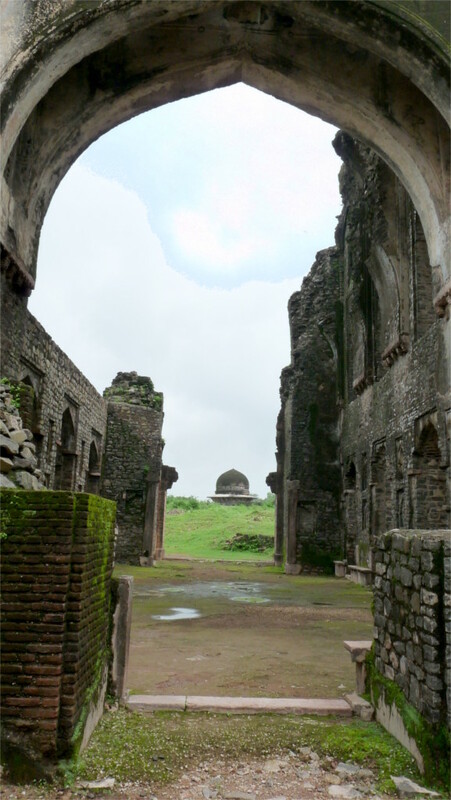 The village of Mandu was barely noticeable when we first visited eight years ago. We saw children swimming in the tank inside Baz Bahadur’s palace. We listened to a singer inside the halls of the same palace. We saw people working in the gardens and in the ruins. We saw a few bicycles, but locals mostly walked around the citadel. We could only get food in proper sit-down restaurants, and I remember feeling impatient at the amount of time it took them to get us a tea. The largest employer seemed to be the Archaelogical Survey, which was in charge of maintenance of the citadel. We saw many tourists, but most were from nearby, and had arrived by bus. Things have changed a little. Outside the Jami Masjid we saw a line of food stalls. As we had chai standing in front of one, I took the photo which you see above. Motorbikes are now everywhere. We saw lots of tourists who had driven up there. The village now announces itself in rows of shops: we walked into one to look at Bagh printed cloth. The Archeological Survey continues to provide employment to many, but the tourist trade has opened up to accommodate the swelling ranks of the middle class. As a result, there is more money in the village now. 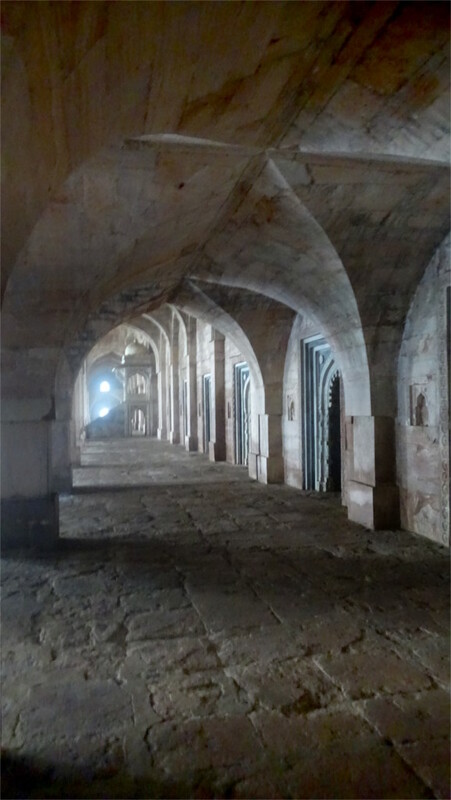 Years ago when we spent several days exploring Mandu we had the time to walk into smaller groups of buildings. One interesting group was the one near Sagar Talao. These are palaces and tombs of people who are not remembered. The structures in the royal enclosure are intact, but here walls have crumbled and roofs have fallen down. Like a beginning student of architecture, I strolled through these ruins marveling at how five centuries can destroy stone walls and flat roofs, while doing little damage to exposed arches until I discovered a little more to the story. After a while I began to notice more details about these tumbled walls. Most obviously, you see the rubble masonry inside the walls. You can see the ill-fitting stones which would have been held together with mortar. I’d earlier noticed the incredibly thick walls of Hoshang Shah’s tomb. The marble that one sees there cannot have been cut in such thick slabs; probably those are thin sheets covering a rubble filling. In these lesser buildings, there seems to be little cut stone used (see the featured photo). So, once the mortar was weathered away, the walls could begin to crumble. In the foreground of the photo above you see the base of a pillar on the right made with ill-fitting stone. The base of the pillar on the left is made of tightly fitted bricks. This was a surprise. Who built with bricks? 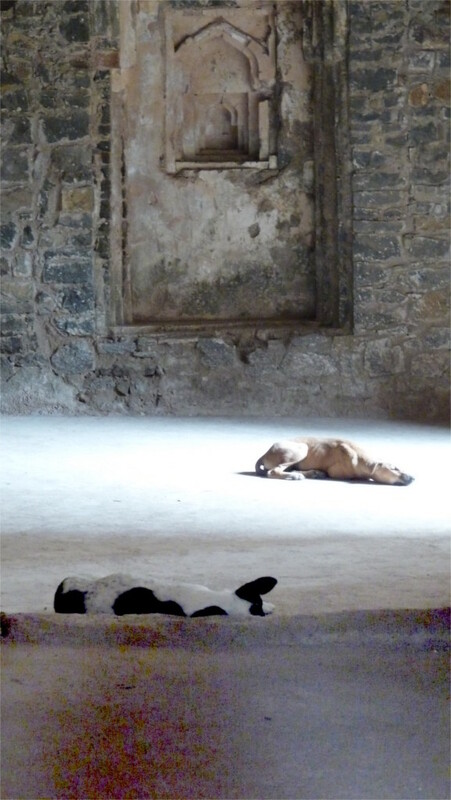 I liked the doorway which you can see in the photo above not just because of the two dogs guarding it. I thought that the sandstone was very well-chosen, with two different colours in the arch. I don’t know whether this comes from the 15th century CE, or a hundred years later. In these centuries the architecture of Delhi did marvelous things with coloured stones. What is interesting is that in its own smaller way, the provincial court of Mandu also tried this out. The arch in the photo above gives a complete picture of the method of construction. The doorway is beautifully constructed in carved sandstone. It is set into a rubble wall. You can see the mortar which binds the unshaped pieces of stone. The wall was faced with a thick layer of mortar. You can see parts of it still covering the rubble filling. Moss covers the facade. Any cracks in the mortar will lead to water seeping into it, and softening it until it falls away. These lesser nobles could not afford marble or sandstone to cover the whole wall. Inside one of the palaces (photo below) I saw niches made of plasterwork. 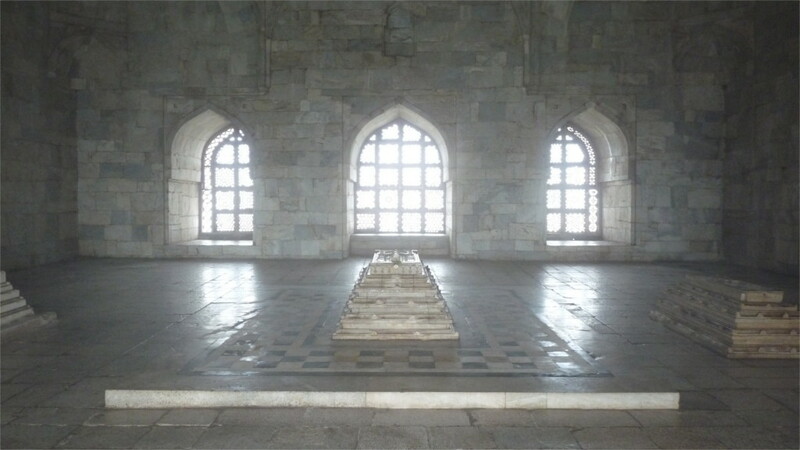 The floors seemed to be made of mortar rather than the flagstones of the Jami Masjid or the royal buildings. Even just outside the royal core of the citadel, the history of buildings and tombs are forgotten. 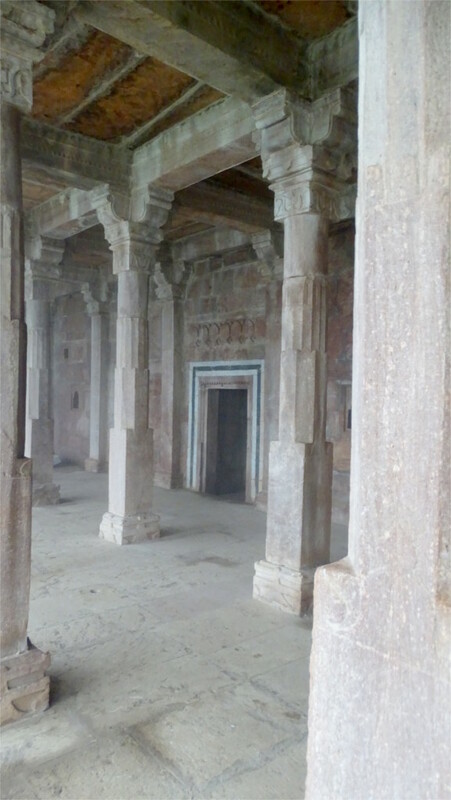 Mandu was a center of literature and arts in the days of the Sultanate; its books are known, its histories documented not only by their own court, but also by travelers and neighbouring kingdoms. If you doubted that history is harsh and forgetful, a stroll through these huge ruins will convince you of your error very quickly. There are two structures in this group which have names that we know: Dai ka Mahal, and Dai ki Chhoti Behen ka Mahal. Both are tombs; the first of a royal wet nurse, the second of her sister. Would they be minor nobility or slaves? I never found out which royal was nursed, nor anything else about the persons who were memorialized in these tombs. 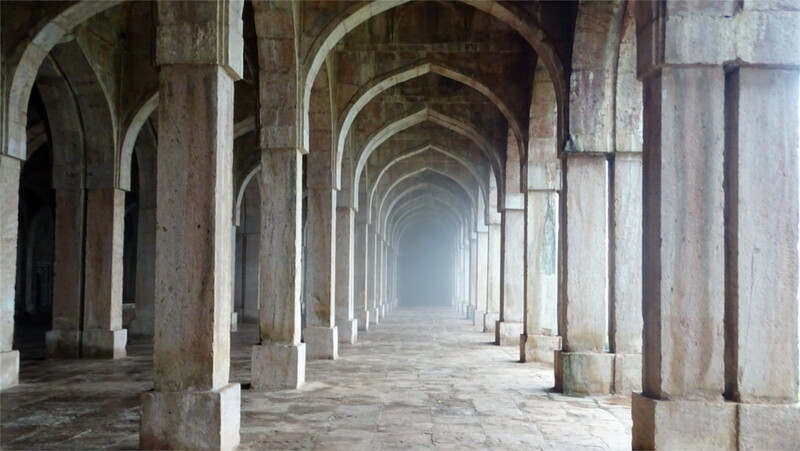 The Jami Masjid of Mandu is a grand building. First of all, it is grand in size. Apparently it encompasses 88 square meters. In the thick fog which enveloped it when we came to it, this makes it a mysterious place. At its height Mandu must have held a large population to require a mosque of this size. I’d forgotten that you must climb up stairs to enter since this stands on a high plinth. We did, our tickets were checked, and we entered. 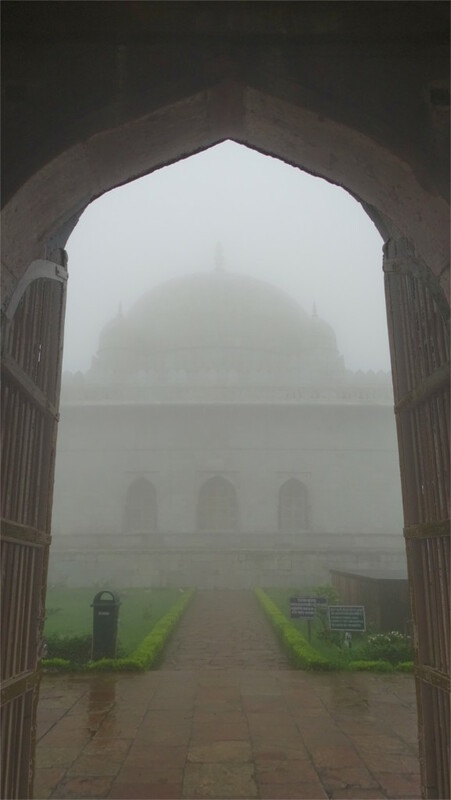 The fog was too thick for us to see the grand dome built by Hoshang Shah’s architects, who continued to labour after his death under Mahmud Khilji, until they completed the structure in 1454 CE. Above the entrance is an inscription which says that the mosque was modeled on the one in Damascus. the early 15th century CE was the era of Islamic internationalism, when the cultural world spread from Al-Andalus in the west all the way to kingdoms of what is today Indonesia. On our earlier visit the fog was thinner, and I got the photo looking west from near the entrance which you can see above. Standing below the dome I looked back at the entrance door and took the featured photo. The fog converted this grandeur into a mysterious space. There were many other visitors, but they were lost to view, and their voices came to us muffled. As we walked through the southern gallery I took the photo which you see above. The pillars are completely plain; it is the sheer numbers which gives the place its grandeur. The height of the ceiling decreases from the courtyard to the back wall. In the photo above, you can see the vaulted ceiling over the last row. This kind of groin vault is typical of Indo-Afghan architecture, and seems to be imported directly from earlier buildings in Delhi. The row of prayer niches (mihrab) on the back wall are just set into a curtain wall. The load of the ceiling and roof is taken entirely by the pillars. Another interesting thing that you can see in this photo is the minbar or pulpit. Contemporary travelers compared this decorative minbar favourably with the carved wooden pulpits of the Maghreb or the decorative stone pulpits of Egypt. This hall was not made of bare undecorated stone when it was new. I looked a little more closely at the main mihrab. The remnant of white and blue tiles can still be seen. It was quite dark, and I could not see any inscriptions here, although they are said to be legible. 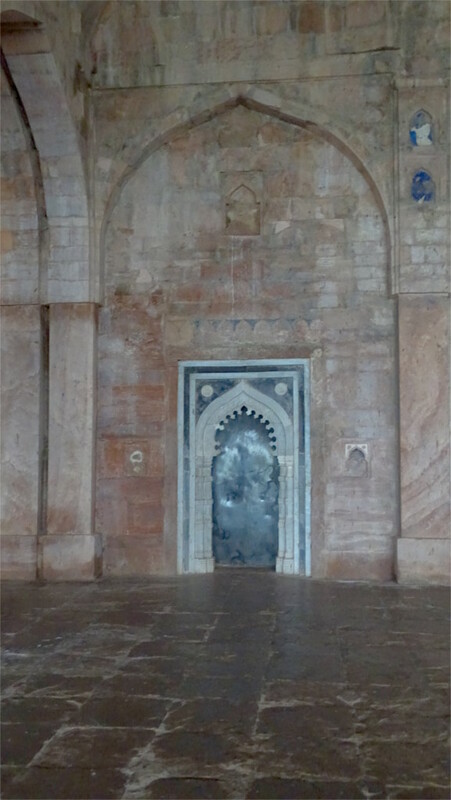 Six centuries have not been kind to the mihrab. On the other hand, if you compare the wear on the flagstones, the prayer niche seems to be in reasonably good shape. 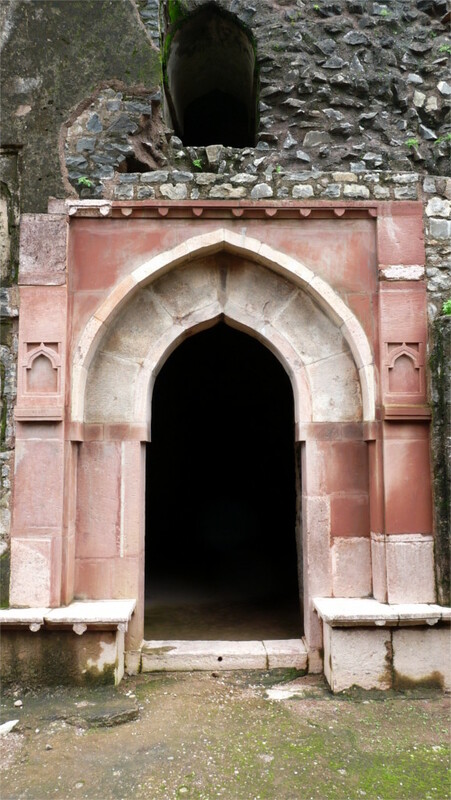 Another characteristic of Indo-Afghan architecture of Mandu are the stone screens on windows. 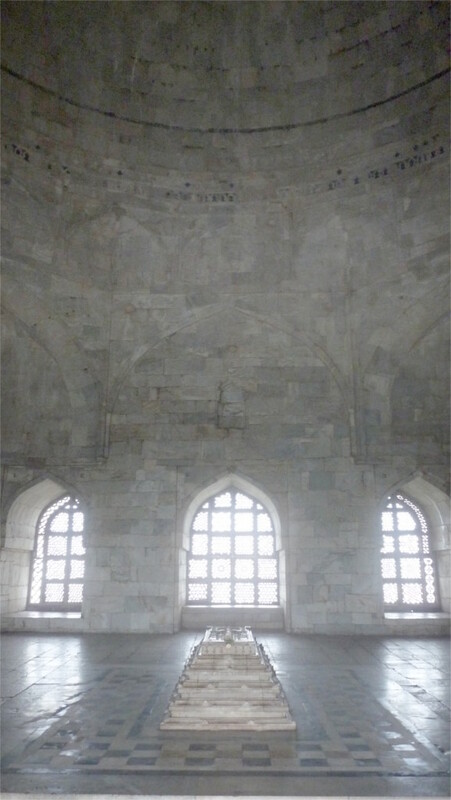 In these two windows you can see that most of the panels use geometrical designs of octagons and eight-pointed stars. I liked the panels with eight-petaled flowers. Equally interesting are two of the other panels which mix squares of two sizes with eight-pointed stars. Unlike most of the other panels, this design can be repeated over and infinite sheet, and constitutes what would today be called a tiling of the plane. I wonder whether there were stone-masons trained in geometry, or whether the design and execution of these panels were separated functions. Ruins and villages may be closer to nature than cities, but they are not exactly forests. The birds that you see in such places are ones which have adapted to profit from the disturbances that humans create. 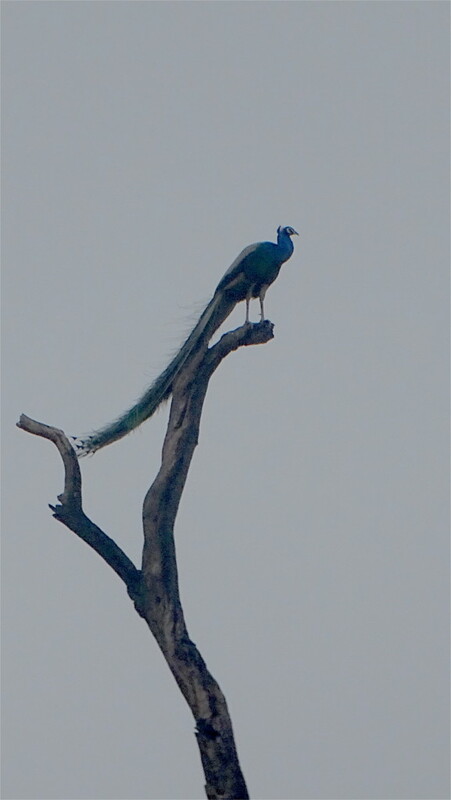 Around Mandu we saw several birds, but a bird watcher in a city will see most of them. The featured photo shows the green bee-eater (Merops orientalis), common across a huge swathe of sub-Saharan Africa and southern Asia: from Senegal in the west to Vietnam in the east. I love this colourful and commonly visible bird. I hadn’t realized earlier that it is appropriate for Independence Day; it has the colours of the flag. 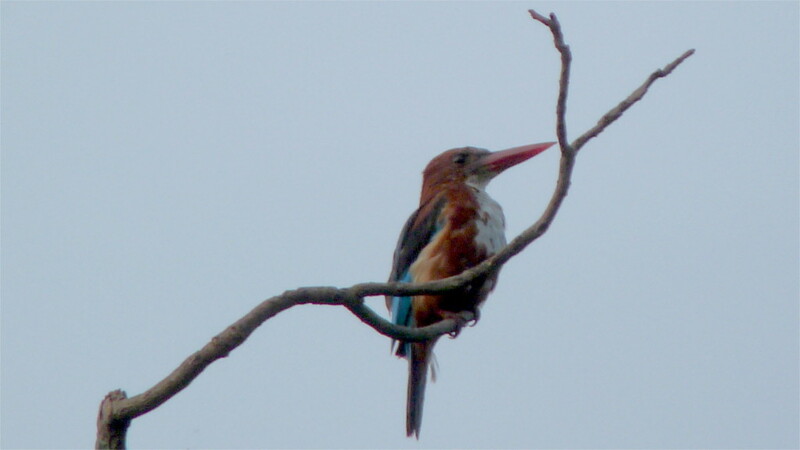 The white-breasted kingfisher (Halcyon smyrnensis) is another common and widespread bird, being found across Asia, from Turkey to the Philippines. It has learned to supplement its diet by scraps of meat from kitchens, and is now commonly seen around human habitation near water. It allows a photographer to get reasonably close, so this shot against the sky is not among the best I have. 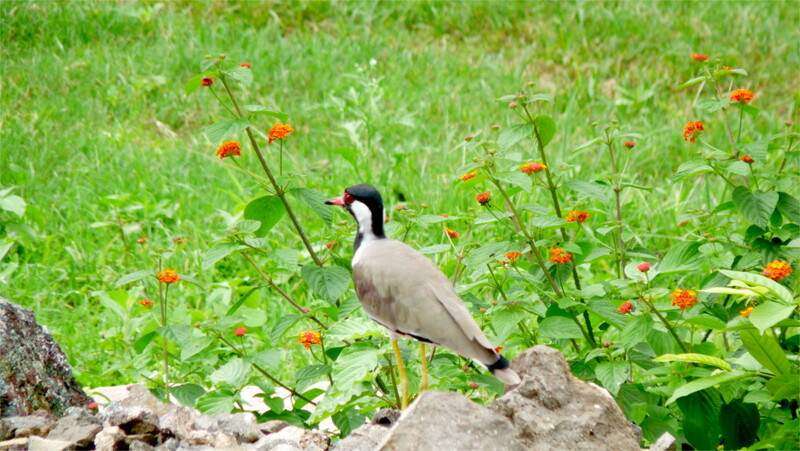 The red-wattled lapwing (Vanellus indicus) is not easily visible inside a city. But this large wader is common in wetlands anywhere in southern Asia, from Iraq to the Philipphines. I saw these large birds everywhere in Mandu, even in Jahaz Mahal. This photo was taken in the garden just outside the palace. Although this is not a high-quality photo, I’m fond of it because I caught two different species in the same shot. 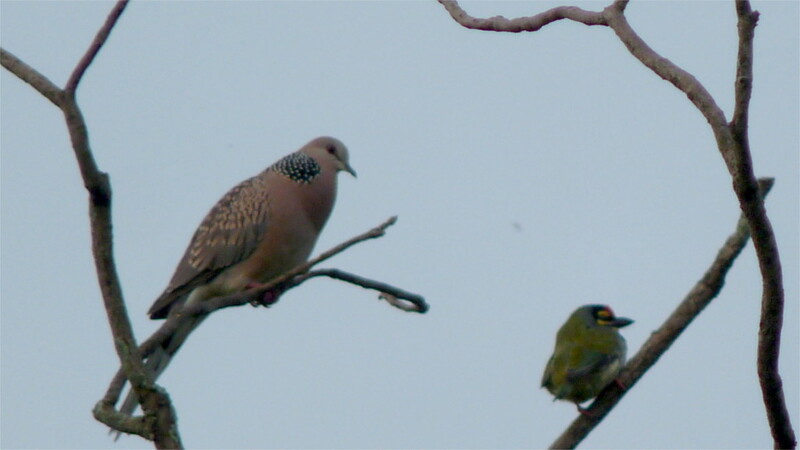 The spotted dove (Streptopelia chinensis) is common is various terrains, including cities, across Asia. It has been introduced in Hawaii, California, Australia and New Zealand. The other bird is a coppersmith barbet (Psilopogon haemacephalus) was common in our garden till recently. It is a common Indian bird. Like the rose-ringed parakeet, the Indian robin (Copsychus fulicatus) is another species which I notice around ruins. 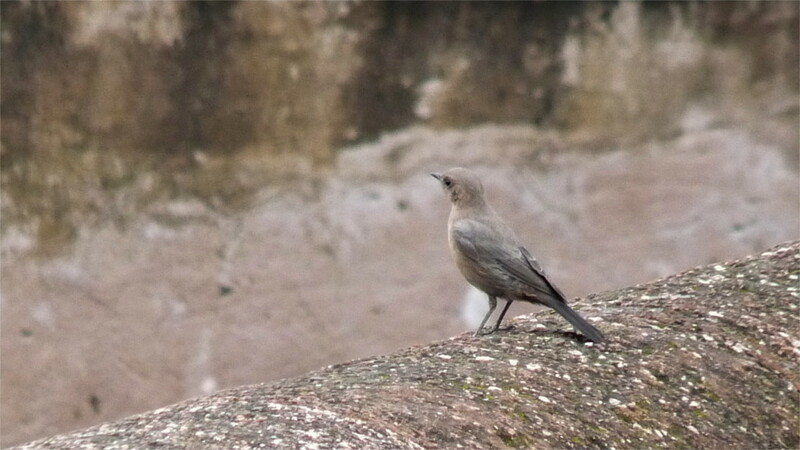 I watched this one as it hopped and flew along ruined walls in Mandu. Unlike the parakeet, it does not take to gardens inside cities. We were not really looking for birds, but were happy to have this added extra. For someone like me who lives in an expanding city, it is an interesting experience to visit the capital of a vanished kingdom. Mandu is one such; a citadel and its surroundings have fallen to ruin. A capital city has reverted over centuries into a tiny village. That village has begun to expand again as tourists come in, although it will never grow to the size of the ancient capital. Flung away from the central monuments are the forgotten little tombs and crumbling walls, falling slowly into ruin. Far away from the citadel, the fog lifts, although the July sky remains grim and threatening. So far from the center of the city that once was, any tomb would be that of a minor noble, at best a footnote. A person described by T.S. Eliot as “an attendant lord, one that will do to swell a progress, start a scene or two”. Six centuries later, the name of the person buried in this tomb is forgotten. I stopped the car to take some photos. I had half a mind to walk up to the ruins, but the ground seemed too squelchy after the rains. I walked along the road and took a couple of photos. The Family resolutely ignored me and remained deep in communion with her phone. The half dome on a drum over a ruined base was very much in the style of the Indo-Afghan architecture in Mandu. Ruins of this kind always bring to my mind one or another English romantic poem. Byron’s words about Newstead Abbey ran through my mind, “Through thy battlements … hollow winds whistle, thou … art gone to decay. In thy once smiling garden the hemlock and thistle have choked up the rose which once bloomed in the way.” It wasn’t too appropriate; there were no battlements, and the vegetation was different, but the spirit seemed about right. 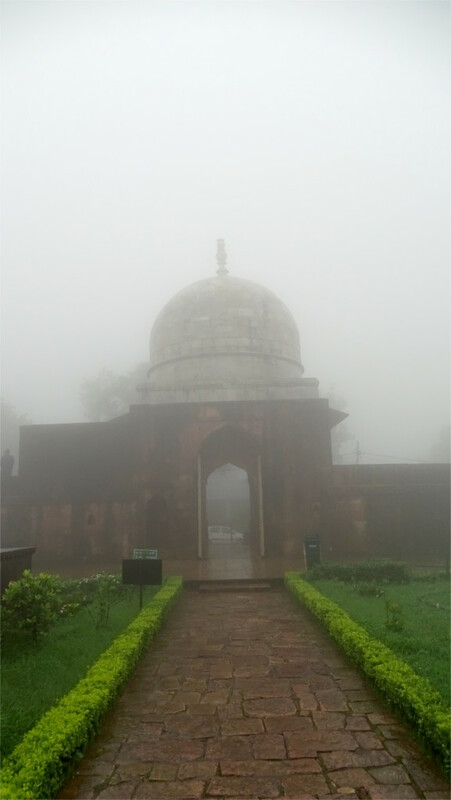 One of my most vivid memories from a previous visit to Mandu was the tomb of Hoshang Shah, the second sultan of Malwa. He is primarily responsible for building up the citadel of Mandu, where his father, Dilawar Khan, had decided to move the capital from Dhar. He ruled from 1406 CE to 1435 CE. I’d seen his tomb in a dense fog. Now, when I reached Mandu again, I was impatient to get to this tomb. 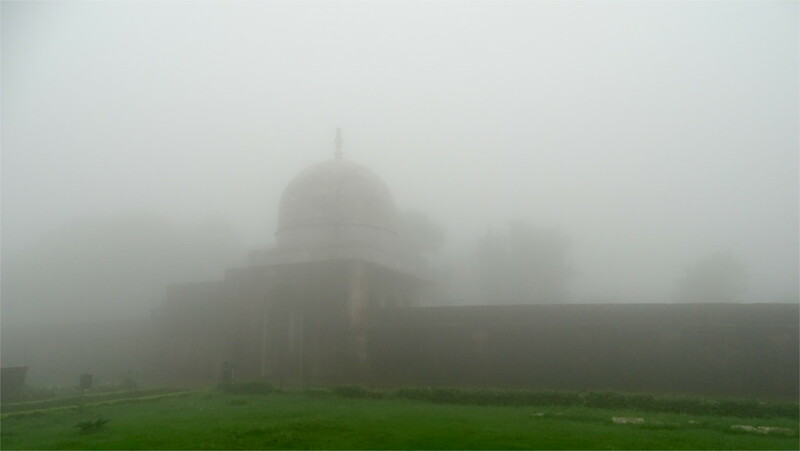 Again, a dense fog had descended on the citadel. We entered the main gateway and saw before us the north face of the luminous structure which deserves to be much better known than it is. In the last few years a few more signboards have sprouted in the small lawn in front of it; a garbage bin is strategically placed to appear in every photo you take. But the white marble tomb remains as well maintained as the version in my memory. The grounds around the tomb are not very extensive, so every photo you take of the structure distorts it a little. Finished in 1440 CE by Hoshang Shah’s successor, Mahmud Khilji, the tomb is famous as the first marble structure built in India. The structure stands on a pedestal which came up to my head, a little less than 2 meters. The mausoleum has a square plan, with the walls rising 9.6 meters high. The main dome is surrounded by four minarets. A photo taken in 1882 by Raja Deen Dayal seems to have been taken from further away, so that the distortions of modern photographs are gone. The harmonious proportions of the building can be more easily seen in this old photo. Remembering this photo, I turned and took a photo of the gate from inside. As you can see in the photo above, the gate and wall could be a structure erected in the hundred and forty years since Raja Deen Dayal brought his camera here. The only entrance to the tomb is from the south. To the west is a pillared gallery, which we walked through. This has doors leading off to the side, as you can see in the photo here. I ducked through a door into a room, and saw a further door which opened out to a field on the other side. Was the gallery also built recently? An ASI board tells us that this is called the dharamshala. Until the 19th century, there was an annual pilgrimage (urs) here on the anniversary of Hoshang Shah’s death, so a dharamshala would be natural. But Raja Deen Dayal’s photo is taken from a distance to the north-west. So I guess this gallery was built after the photo was taken. It must have been built before the Archaeological Survey was given custody of this site, because the ASI does not do large scale constructions. I wonder who built it, and where these pillars and stones were scavenged from. Above is a photo of the eastern boundary of the plot. 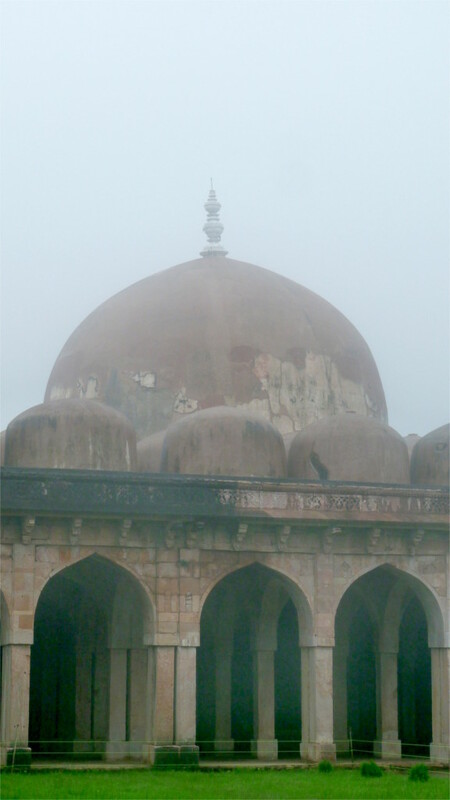 The wall is the western wall of the Jama Masjid, and the domes which are faintly visible in the fog belong to the masjid. These structures are seen in Raja Deen Dayal’s photo. The ASI constantly carries out repairs and restoration. Work was in progress this time around. A framework of steel tubes was being dismantled inside the tomb, and nets were strung out to prevent accidental damage to the structure. I talked to one of the workers, and he said that a leak in the dome had to be repaired. So I switched to using photos of the interior which I took eight years ago. There are three graves within the mausoleum. The central one belongs to Hoshang Shah. I could not find who are the others buried here. The door lets in little light, but the three screens in the northern wall admit enough light to see the interior clearly. We paced around the interior, and thought that not only is the ground plan a square, but each of the walls is a square. So each side of the chamber must arout nine meters long. As a result, the shape of the building is like a cube with a hemisphere resting on top of it. When you look from outside, the sphere seems to have has a diameter smaller than a side of the square over which is stands. However, when you look at it from inside (photo above) it seems that the hemispherical dome sits atop a square whose side is equal to its diameter. The difference between the outside and the inside views must be the thickness of the wall. That is quite a bit, as it must be to support not only the dome but the minarets above it. I come here to look at the little details. Take the two wonderful screens above. One has alternating panels of hexagonal and octagonal symmetry as you go from top to bottom. The other contains a surprise: between the hexagonal and octagonal panels is one which shows seven-fold symmetry. The construction of the heptagon by distortions of hexagons is quite amazing. These artists were not interested in more modern concerns like tiling an infinite plane with repeating motifs. Within the limited scope of a design contained within a finite panel, they solve these problems very elegantly. 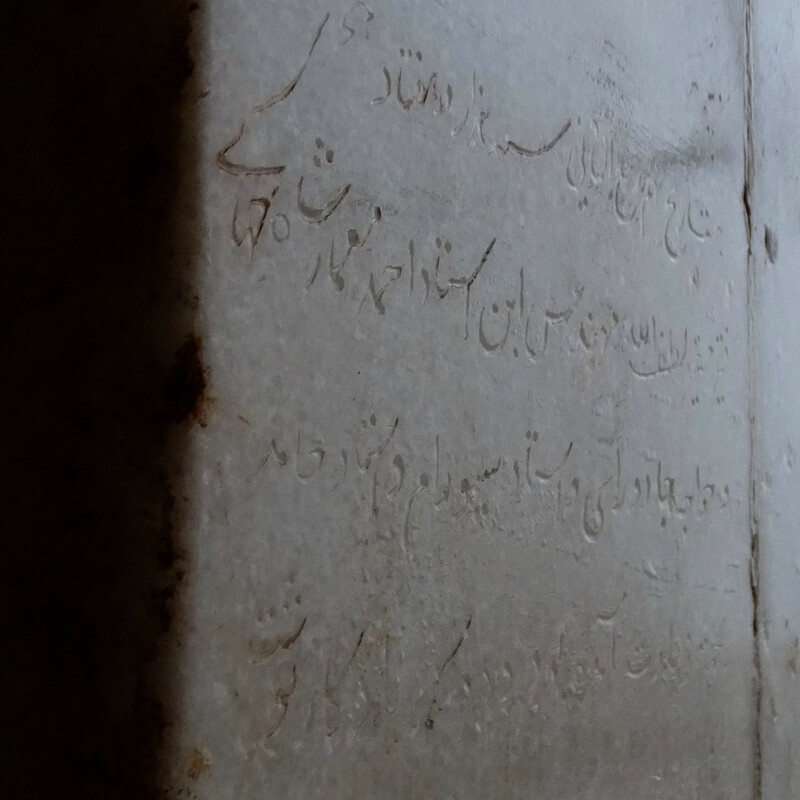 Ustad Hamid had this tribute carved a little more than 200 years after the tomb was finished. Another 200 years, and a little more, would pass before Raja Deen Dayal brought his bulky cameras and plates here and took his photo. Somewhat less than 200 years later, The Family and I came by and fell in love with it.